As well as enjoying the Batman slot from Cryptologic, you can also try your hand at some of the other titles featuring the Caped Crusader. With so many ways to win, these slots will have you saving Gotham City and feeling super human in no time! 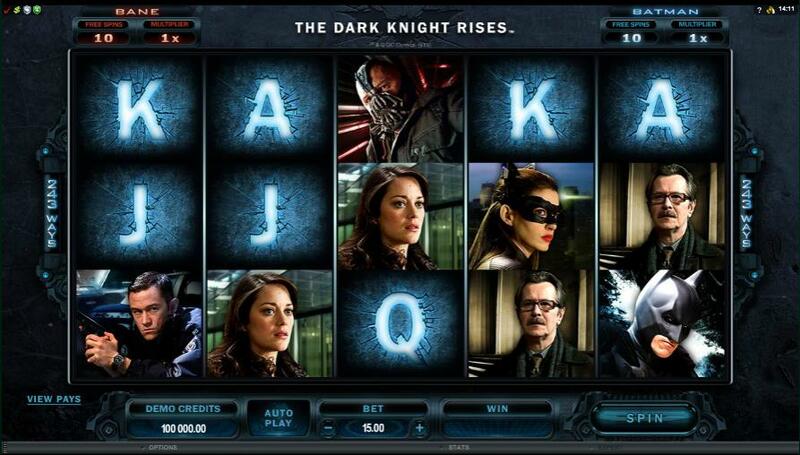 Based on the critically acclaimed movie The Dark Knight, this progressive slot offers you 243 exciting ways to win. Containing cinematic movie clips that play after successful spins, this slot has a whole host of surprises up its sleeve and even has four progressive jackpots up for grabs, the largest being worth at least ?1 million. Fighting crime could result in you swooping in to rescue a huge prize! The Joker is back and plans to bring havoc to the streets of Gotham and it's up to Batman to defend his beloved city, but he needs your help! Begin by selecting the size of wager you wish to place on each spin, ranging from 0.30 to 6.00 credits. Bets can by altered using the - and + symbols at the bottom of the game screen. The return for each combination of symbols can be found by selecting the VIEW PAYS button in the lower left hand corner of the game screen. Once you are happy with the size of your wager, click spin and let battle commence. Once the reels have come to a stop the slot machine will display any successful combinations and add any winnings to your account. The aim of the game is to match as many symbols as possible to win amazing prizes. 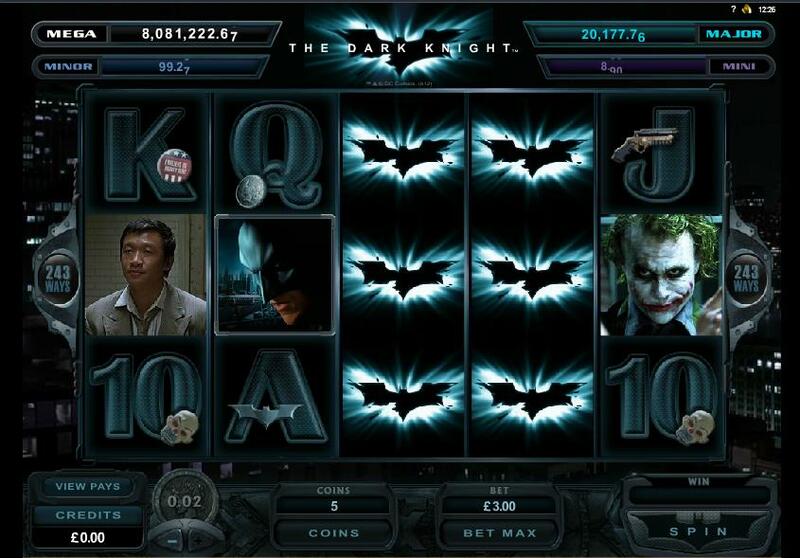 The Dark Knight slot operates as a progressive slot machine and boasts four tantalizing jackpots, the largest of which is a guaranteed ?1 million. The progressive slot bonus is generated randomly and once it has become active, you must choose between Batman and the Joker to determine your destiny. The higher your stake, the more likely you are to gain access to the jackpot round. Successfully matching three or more Joker scatter symbols on any of the five reels generates a Free Spins feature. As the name suggests, you will be rewarded with 15 free spins, with any prizes won during this time benefitting from a 2x multiplier. Watch out for Batman and the Joker wandering across the bottom of the screen as they can appear at any time during the base game to award random cash prizes, wild reels or extra wilds. The two adversaries can also appear during the Free Spins feature to award extra free spins or increase the multiplier from 2x to an impressive 5x. Based on the massively popular movie The Dark Knight Rises, this slot allows you to join Batman as he comes out of retirement to do battle with masked supervillain Bane. This action packed slot offers 243 ways to win and a whole host of exciting bonus features and allows you to relive this modern classic. Bane is threatening the reels of Gotham and it’s Batman’s job to end his evil rampage, but he’s relying on your help! Select the coin size and the number of credits that you wish to bet. By selecting the VIEW PAYS option in the lower left hand corner of the screen you will be able to see the value of each combination based on the number of credits that are bet. The slot offers an autospins feature, where you can choose between 10, 25, 50 and 100 spins. This can be customised to allow unlimited spins, a feature that will continue until manually stopped or you have insufficient funds to complete the spin. Once you are satisfied with your total bet, click spin to begin. The reels will come to a stop and the slot machine will display any winning paylines and automatically transfer any credits to your account. The aim of the game is to match as many symbols as possible with a possible 1,780,000 credits up for grabs. Batman and his nemesis Bane take to the reels in front of your very eyes to do battle during the base game. Randomly triggered following a non-winning spin, the two characters enter the arena to fight it out, resulting in you as the onlooker being rewarded with free spins and multipliers. The Symbol Scatter feature offers you an additional chance to win by scrambling all of the symbols on the screen to create the best possible winning combination. The feature is triggered randomly following any non-winning spin. Triggered randomly, wilds can split into two to create more winning combinations. Split wilds can produce a six of a kind win, an outcome that pays twice the value of a five of a kind. When a wild symbol lands anywhere on reel three, the reel will expand to complete additional pays. That means that matching just two symbols on any selected payline could result in a much larger win. A host of other Batman slots are also available, based around Batman's adventures with specific characters. There is Batman and Catwoman Cash, as well as Batman and the Batgirl Bonanza. Three more Batman games were released by Playtech at the start of 2017, inspired by the 1960s television series starring Adam West - Batman & the Penguin Prize, Batman & the Riddler Riches and Batman & Mr Freeze Fortune.